I remain enamoured with Frankie Brown’s Ten Stitch Knit Blanket and have now converted it into a Tunisian Crochet Pattern (with Frankie’s kind permission). This blanket is worked in a 10-stitch spiral around an initial 10 stitch x 10 row square, and is suitable for Adanced Beginners. 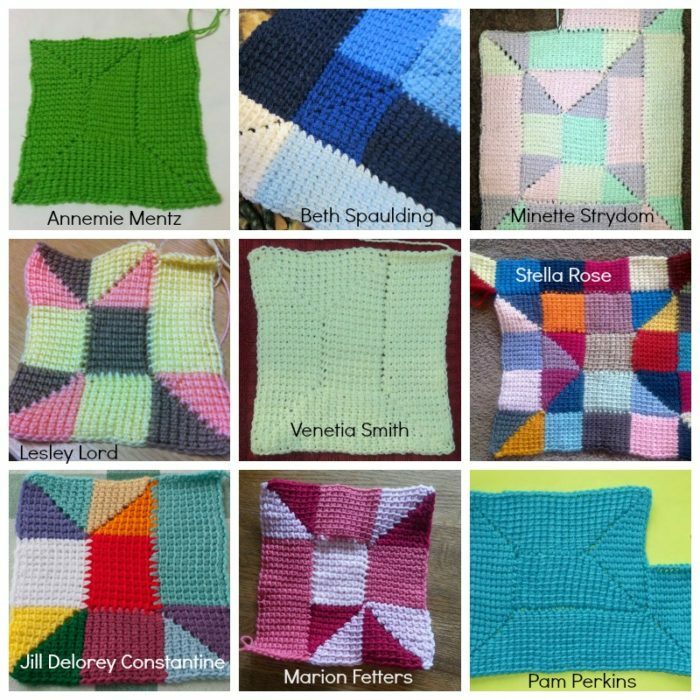 I have changed colours for each section to make it easy for you to distinguish between the different sections, but you can always use one colour for your whole blanket. Slow colour change yarn works really well! 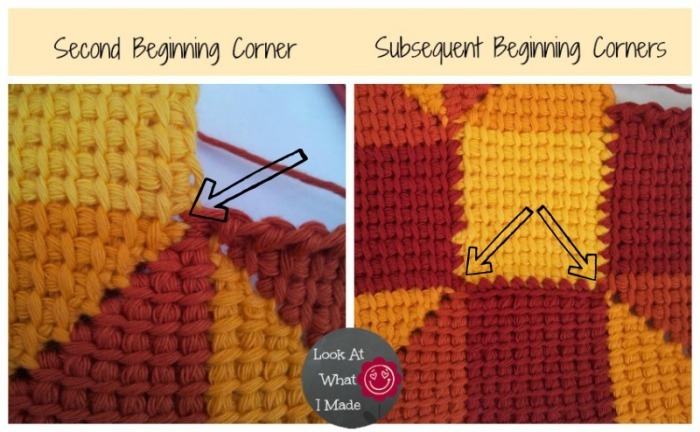 Because Tunisian Crochet yields a more dense “fabric”, this blanket does not drape as well as the knit/crochet version, but by altering your hook size you can easily remedy this. What is a Ten Stitch Blanket? The Ten Stitch Blanket is worked in a spiral (or “rounds of rows”) around a central square of 10 stitches by 10 rows. The beauty of the project is that the short rows (10 stitches per row, less on the corner rows) propel you forward like you wouldn’t believe and it is the perfect pattern for using up any and every scrap of yarn in your house. When you decide that your Tunisian Crochet Ten Stitch Blanket is large enough, simply stop at the end of one of a Middle Sections and work a slip stitch row as indicated at the end of the pattern. The photos below were taken by one of my testers, Terry Spears, who is left-handed and had no problems following the pattern (even though it is written for right-handers). I really have tried to make it as simple as possible. You don’t need a tunisian crochet hook for this! Because there are so few stitches in each row, a regular old crochet hook will do (and might even be easier to wield). You don’t really need to know how to do tunisian crochet either. Each step is explained thoroughly with loads and loads of photos to help you on your merry way. This blanket is the ideal stash-buster. I have used a different colour for each section to better illustrate how they are worked. You are more than welcome to follow this trend. Quite a few of my testers did! It yields a lovely checker-boardy pattern. But there is another (easier) way to use scrap-yarn for your blanket. Why not start with a ball of scrap yarn and then just add the new scrap yarn in when the old yarn runs out? This way you will have less tails to work in and you can use absolutely every last scrap of scrap yarn. Just as an aside, there is NO SUCH THING as stash-busting. Any knitter/crocheter will know that scrap yarn has a way of multiplying. Some of us even buy more yarn when our scrap yarn runs out in the middle of a project, leaving us with MORE scrap yarn, not less. 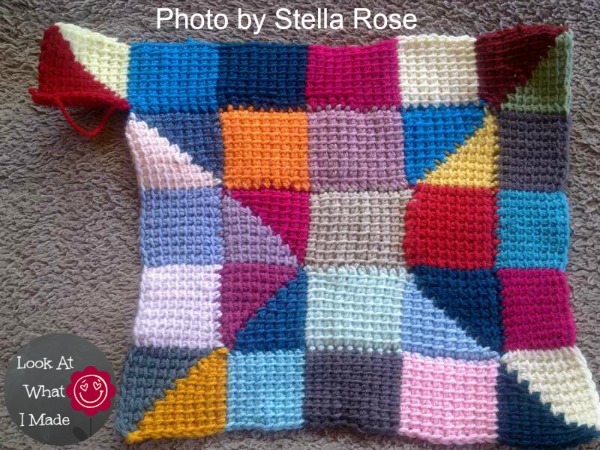 The last alternative is to make your blanket in a single colour. For this I suggest colour change yarn, preferably a yarn with fewer, longer colour changes. Think ombre! Although this is a blanket pattern, you can use it to make cushion covers, table runners, baby blankets, placemats and even rugs. The basic pattern stays the same, you just work less “rounds of rows”. 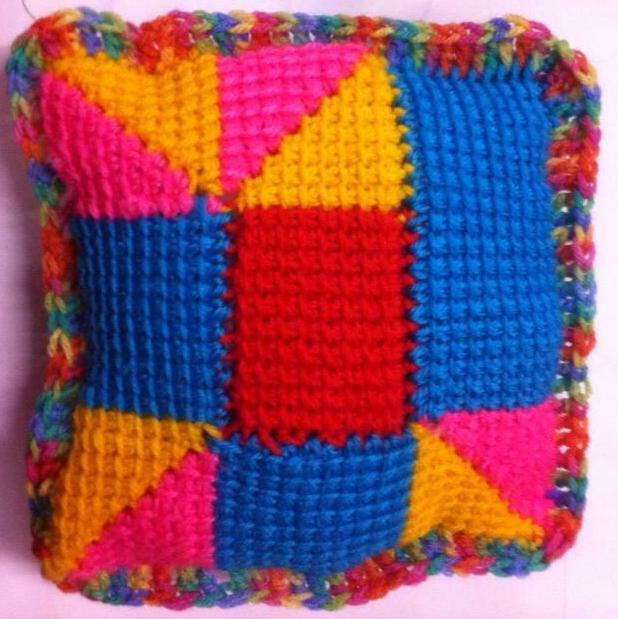 One of my testers’ daughter, Chloe, made her Tunisian Crochet Ten Stitch into this lovely little pillow. Chloe is only 9! Well done, Chloe, and thank you for sharing your awesome pillow with us! 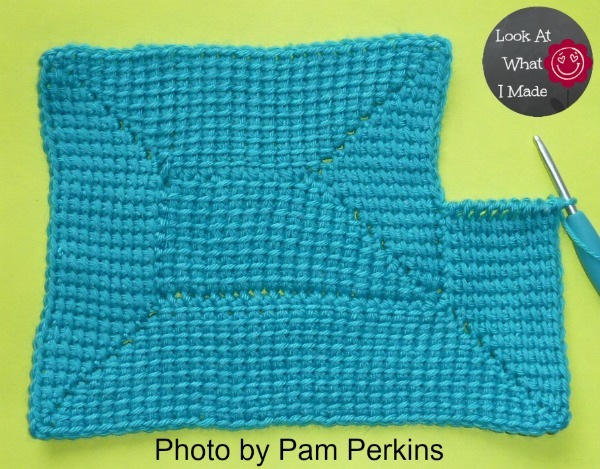 If you would prefer a more rectangular blanket, start with a Beginning Square that is 60 – 100 rows long (obviously it won’t be a square anymore if it has 60 – 100 rows). 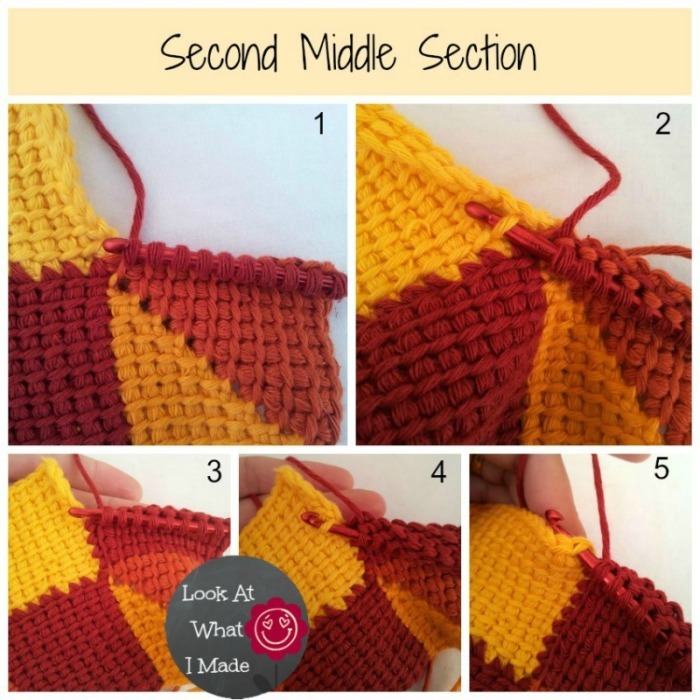 Then, following the Diagram below and the pattern itself, work the rest of your blanket, altering the amount of rows in each Middle Section accordingly. Your Ending Corners and Beginning Corners will remain unchanged. The resulting blanket will be longer than it is wide. Exactly by how much will depend on the amount of “rounds of rows” you make. The bigger your blanket is, the smaller the difference will become. I strongly advise making a little sampler first so that you get a feel for the blanket. Once you know what goes where, go ahead and alter it in any way you like. 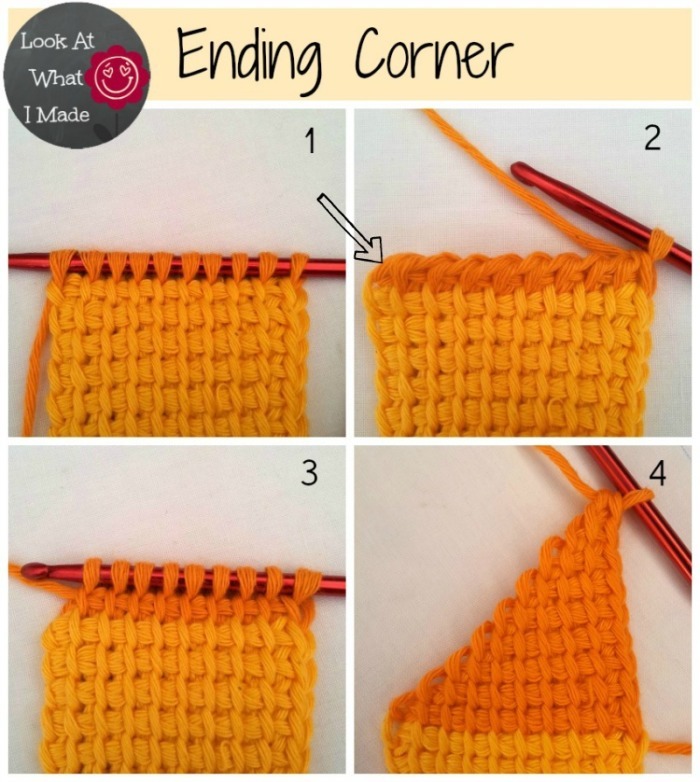 Ch-2 Space – This is the corner stitch (the pointy end of each corner), formed by starting the Beginning Corner with a ch-2. When changing colours, do so on the last yarn-over of the last stitch of the row before you wish to change colours. Unfortunately there is no “easy” way to get rid of all the yarn ends. You can’t crochet over them, because they are to the back of your work and you are working through the vertical bars, which are on the front of your work. You’re going to have to weave them in, I’m afraid. If you are well-versed in Tunisian crochet, just skip this little blurb. In normal crochet (for lack of a better word) you work each stitch on its own and each row goes only in one direction (usually from right to left if you are right-handed). Forward pass: Skipping the very first vertical bar, insert your hook into the next vertical bar and pull up a loop. Insert it into the next vertical bar and pull up a loop. Keep pulling up loops until you have worked into all the vertical bars (including the very last one). Reverse pass: Ch 1 (In some patterns this might be written as: Yarn over and pull through one loop only). *Yarn over and pull through 2 loops* until you have only one loop remaining on your hook. For the first square I will keep to this format so that you can get the hang of it. For the subsequent sections (Ending Corner, Beginning Corner and Middle Section) the reverse pass will be indicated in bold. To create the decreases in the Ending Corner and Beginning Corner of this pattern, you will skip the initial Ch-1 of the reverse pass. This will create what I will refer to as a diagonal bar (see photo below). Only work into these diagonal bars when the pattern calls for it. 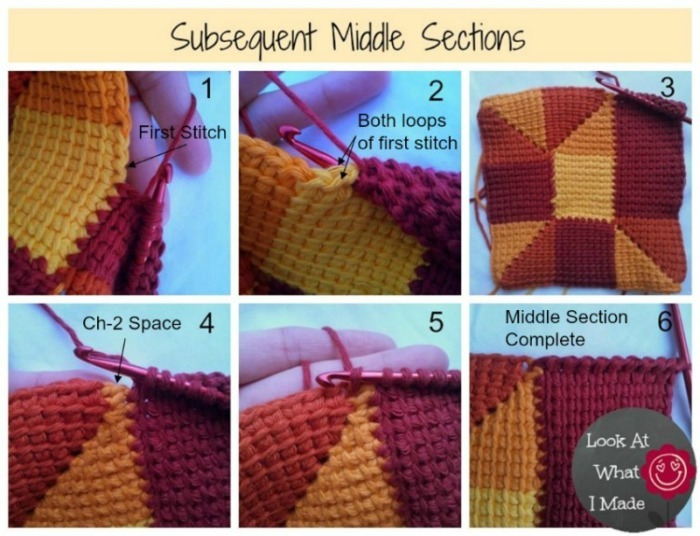 When working the Middle Sections of this pattern you will also skip the initial Ch-1 of the reverse pass. Hint: Keep you tension loose! It’s a lot more pleasurable when you aren’t having to wrestle with each stitch. And as an added bonus your work will curl a lot less if you keep your tension nice and relaxed. Please follow this diagram when deciding which section to work next. Do NOT just follow the Instructions (below). They only tell you HOW to make each section when the diagram calls for it. 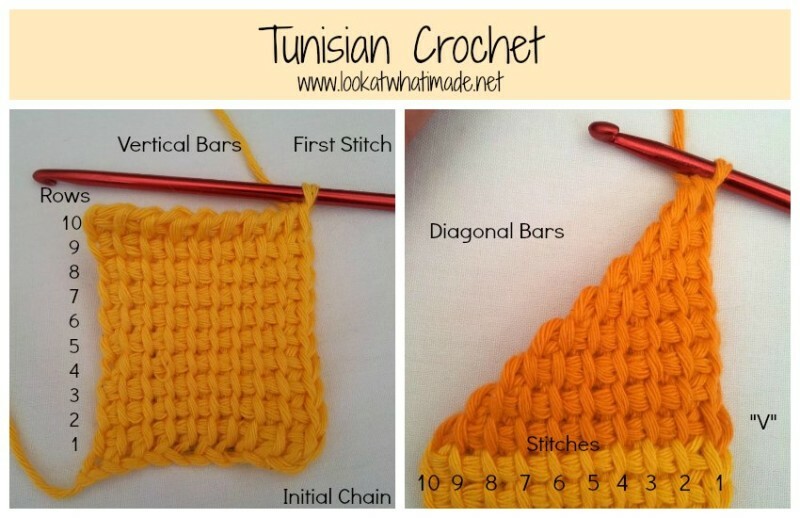 Please remember to follow the diagram (above) when making your Tunisian Crochet Ten Stitch Blanket. The instructions below will only tell you HOW to make each section, not WHEN to make them. Ch 10. This foundation chain does not count as a row (Photo 1). Forward pass: Pull up a loop in the second chain from the hook (Photo 2) and each subsequent chain stitch (Photo 3). You should end up with 10 loops on your hook. Forward pass: Skipping the very first vertical bar, pull up a loop in each of the 9 vertical bars across. 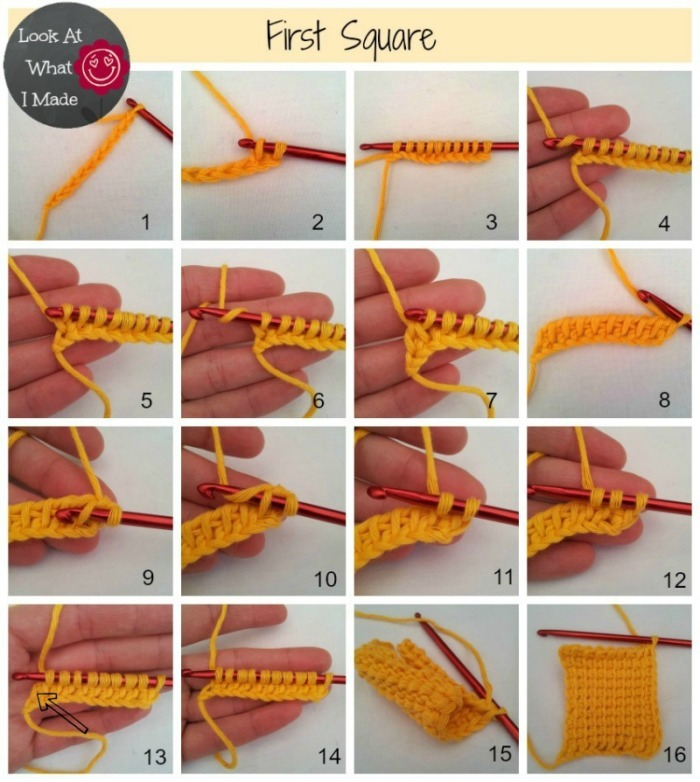 To do this, insert your hook into the next vertical bar, yarn over and pull up a loop (Photos 9-12). Repeat this for each vertical bar. Don’t forget to pull up a loop in the last vertical bar (indicated with an arrow in Photo 13). You should have 10 loops on your hook (Photo 14). Your First Square will curl quite a bit (Photo 15). Don’t worry about it! Photo 16 shows the First Square Completed. Please Note: The diagonal loops formed by the decreases have not been included in the stitch counts in parentheses. In this section you will be working into the diagonal bars formed by the decreases in the Ending Corner section (see the arrow in Photo 2 above). 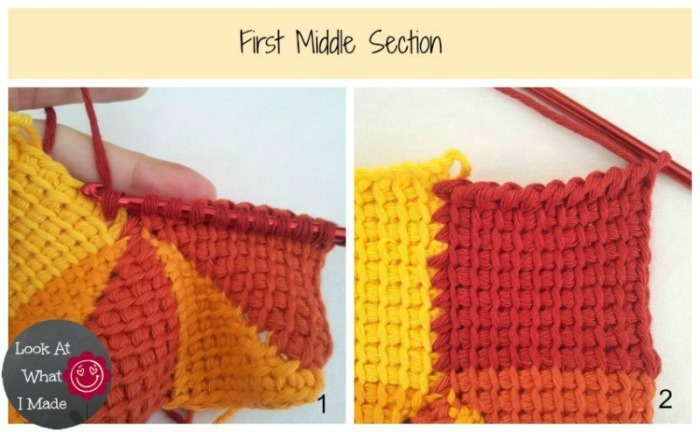 Work as the First Beginning Corner up to and including Row 7. You will be joining this First Middle Section to the side of the First Square. 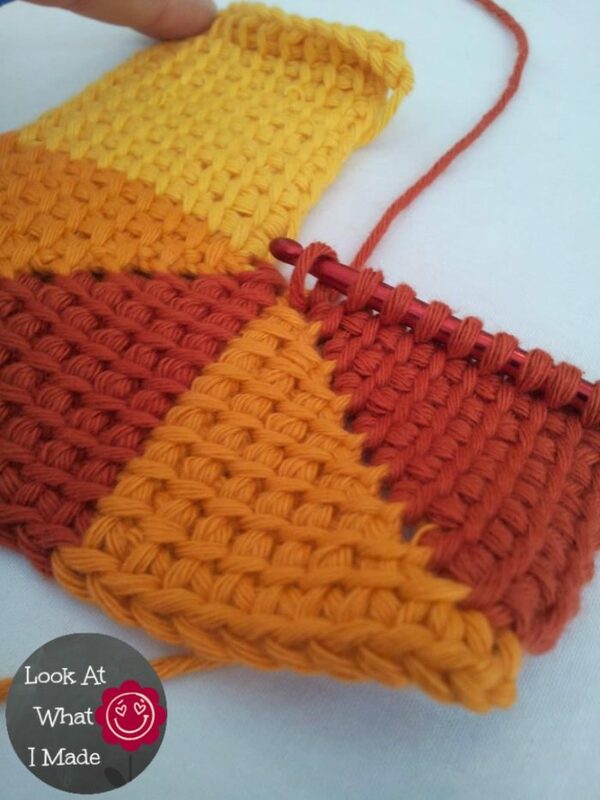 At the end of each row, you will need to draw up a loop in the last stitch of the relevant First Square Row. To do this you will need to insert your hook from front to back between the 2 horizontal bars (see photo below) of the last stitch of the First Square so that it catches the hidden back vertical loop. Don’t try to look for it, it is very well hidden! Just poke your hook in there and pull up a loop. Inserting your hook in this way will ensure that you do not have unsightly holes running along this seam. If you find it too tricky to catch that hidden back vertical bar, you can always just insert your hook into the last vertical bar of each First Square Row and pull up a loop. Just bear in mind that this will cause holes along this seam. Photo 2 below illustrates the Completed First Middle Section. Repeat this until you have worked into all the rows along the relevant side of the blanket. You will know you have worked into all the rows when you get to the ch-2 space in the corner, formed by making the 2 ch st’s at the beginning of each Beginning Corner (Photo 4). You will join the last row of the Middle Section to this ch-2 space. When your blanket is as big (or as small) as you want it to be, STOP. Well, not immediately. If you stop in the middle of a Middle Section, or at the end of an Ending or Beginning Corner, it will look too funny. So once you’ve decided that enough is enough, crochet your way to the second last row of the Middle Section. For the binding-off row, sl st into each vertical bar across. To do this, insert your hook into the first vertical bar, yarn over and pull through the vertical bar AND the loop on your hook. Do this for each stitch across. When you get to the end, make a sl st into the ch-2 space and bind off. You can find an excellent video tutorial by HERE. It is by Kim Guzman. She’s a bit of a Tunisian Crochet Guru. If you feel like it, you can always work a single round of single crochet all the way around the blanket. 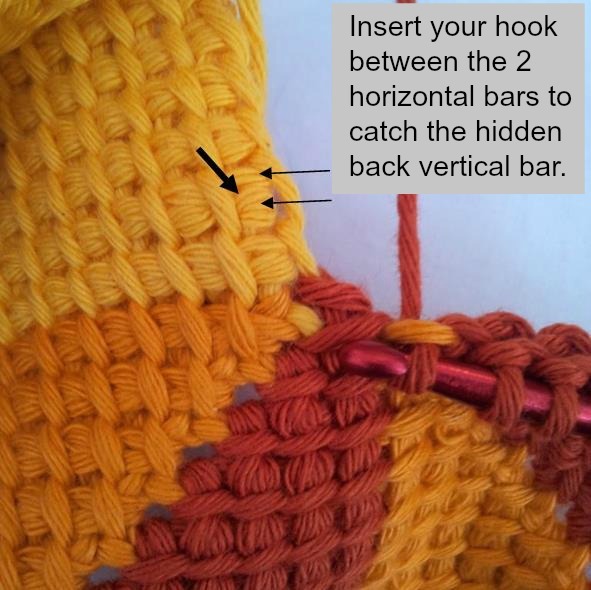 With a slip knot already on your hook, sc in any of the ch-2 spaces at the corners of the blanket. *Work a sc through both loops of each stitch across. (Sc, ch 1, sc) in the ch-2 space at the corner. Turn your blanket 90 degrees. * Repeat from * to * for each of the 4 sides. When you get back to the first corner, so the ch-2 space that you started in, (sc, ch 1) in the ch-2 space. Sl st to the first stitch of the round and bind off. Work away your tails. Remember to subscribe to my newsletter if you would like to be kept in the loop. You can also like my Facebook page or follow me on Bloglovin or Google+. If you have any questions, please do not hesitate to contact me. Just to let y’all know, I am working on this pattern using the Tunisian Net Stitch and that with a little finagling it is possible to crochet over your tails when you change colors to lessen the amount of sewing you have to do later. When you push the hook through front to back to pull a loop, if you alternate between going over and under the tails between stitches, when you pull the yarn through it will anchor them quite well. I wish I could video or draw it, but I’m not good at either. But, with a net stitch, it’s possible to anchor your stitches as you work. Hope this helps someone! Love the look of this pattern! I’m ready to order yarn; in the materials section, there is reference to using one color, but I don’t see anything regarding the total amount of yarn is required. I found some veriegated yarn that I really like, but don’t know how much to purchase. Thanks! what hook set are you using? i love how the head of the hook you are using is sharper or more pointed. all that i have found so far are very blunt and rounded tips. Hi Kris. It is a cheap tunisian set. I can’t even remember where I bought it as it was so long ago! I think it was on ebay. If I can get my stiff fingers around this pattern , it looks like a challenge for me(80), but one I can master! My 10 X 10 square is not square! It’s taller than it is wide. Where am I going wrong? It’s old t-shirt yarn with a big 10mm hook. Hi Hannah. Have you got a photo so that I can better assist you? I really need to do this, its a lovely effect and something I have never tried before. Thank you, thank you!!! I’ve just started Entrelac last week and am addicted to Tunisian! Can’t wait for your vid! I am very excited about Esther’s video too! I have just learnt to do this on a cruise we just did around Australia. The lady that showed use .her husband makes them. I am after size 4.if any one knows were I can get one please. I usually have no problem with patterns and yours is no doubt very well written… I cannot for the life of me get the second beginning square at all. I have frogged it about 9 times. I wish there was a video. I couldn’t figure it out from the pictures either =[ Lovely pattern nonetheless. Thank you for translating it to crochet. I am sorry that you are finding this pattern so hard. 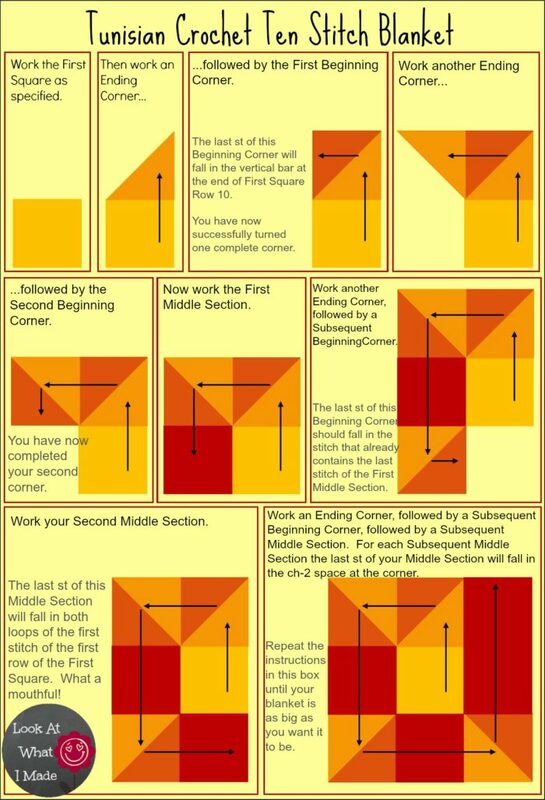 If you email me a photo of where you are up to and explain exactly what about the beginning square is bugging you I can better help you figure it out. You can find a contact form at the top of my website. Is there a video tutorial for your Tunisian Crochet Ten Stitch Blanket? I’m sure that I have seen one, but now that I am ready to start a blanket I cannot seem to find the link. Hi Chris. There isn’t one, I’m afraid. The photo tutorial is very comprehensive, so maybe have another look at that and please ask if you get stuck. Does anyone know what is the difference between the Tunisia stitch and the afghan stitch? Irene, as far as I know they are one and the same thing. Hi Dedri! Thank you for linking up at Link & Share Wednesday :) I am hoping to try this one myself in the very near future :) I signed up for a class to learn Tunisian and once it is done I am all over this! PS Finished my lovey test and will send you the results hopefully tomorrow :) and I LOVE it!! I love this pattern! I am new to Tunisian crochet and wondered if you have a recommended tutorial on how to use the Tunisian crochet hook (I’m new to you blog so please excuse me if I missed any post where you explained how to). Thanks so much! I don’t have a tutorial, but Kim Guzman is a tunisian crochet expert and she has some very clear You Tube tutorials. 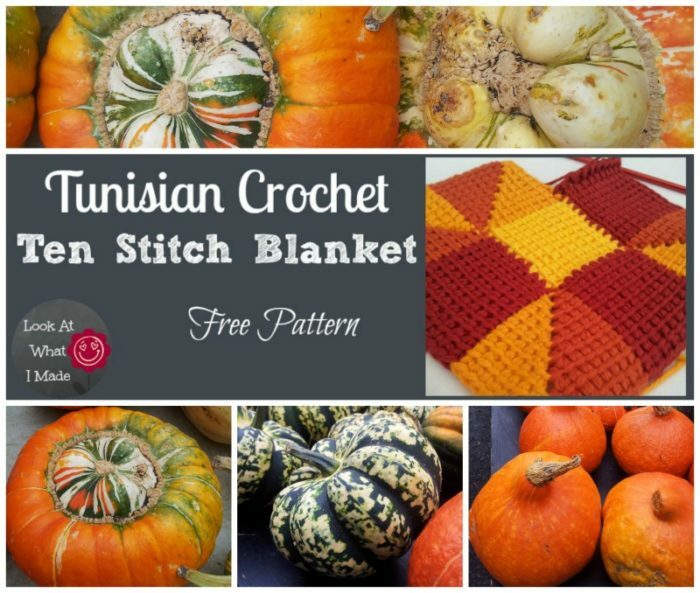 Have you had a look at the tunisian ten stitch pattern? 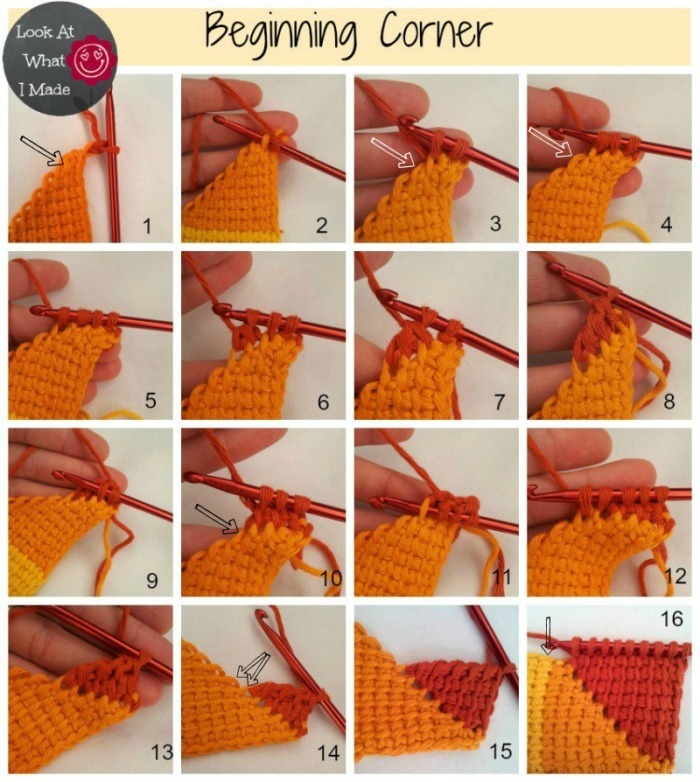 There is a quick how-to at the beginning of the pattern. 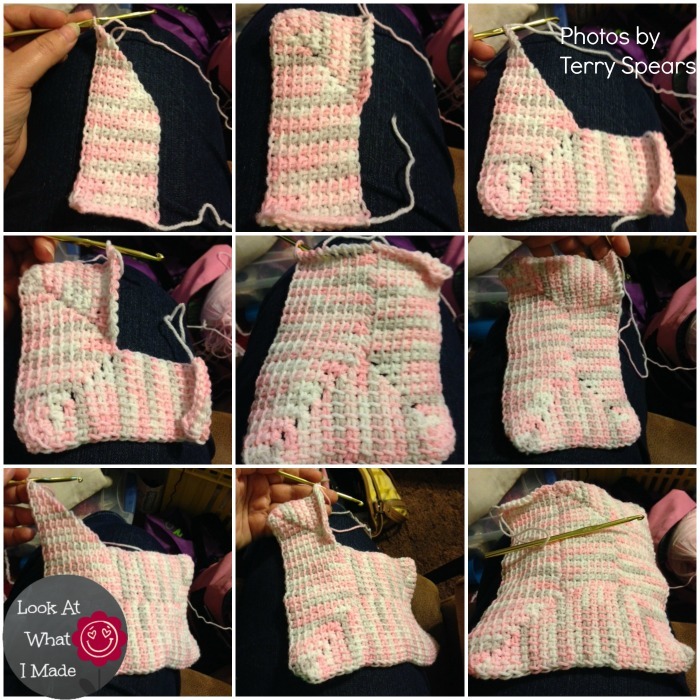 The instructions for the First Square (in the pattern) also include some step-by-step photos.